Members of Ringling Bros. and Barnum & Bailey Circus perform Sunday, May 1, 2016, in Providence, R.I., during the show where Asian elephants made their final Ringling Bros. circus performance. Ringling announced Wednesday that it had hired its first female ringmaster in its 146-year history. 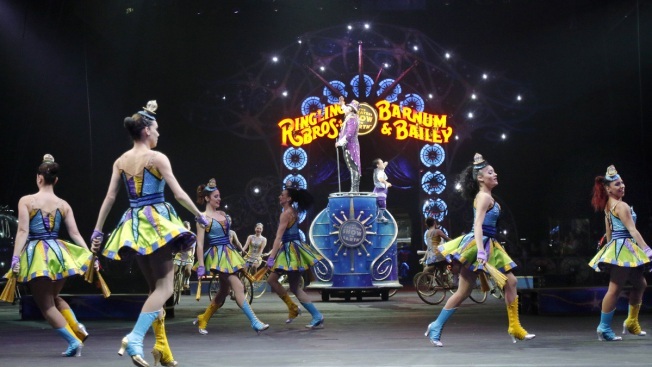 The Ringling Bros. and Barnum & Bailey circus has its first woman ringmaster. Feld Entertainment Inc. is the parent company of the Florida-based circus. The company said in a statement Wednesday that Michelle Wilson will be the first-ever woman ringmaster in its 146-year history. Wilson starts her new role next month and her first performance will be in her hometown of Orlando, Florida, during "Circus Xtreme" show. She will become the 39th ringmaster in Ringling Bros.' history. What's been a tradition at the Ringling Brothers and Barnum & Bailey Circus for nearly 150 years is all coming to an end on Sunday. Elephants will be performing for the final time in that circus. Wilson has a professional background in theater and singing. A ringmaster typically introduces each act in the circus.